Every painting job is one-of-a-kind, but your estimating process shouldn’t be. The easiest way to satisfy your clients and stay on-schedule is to deliver fair, accurate proposals, and that means you need to apply the same exact standards every time. Precise measurements and consistent proposals are only possible if you and your painters apply the same guidelines and processes on every job site, and PEP Cloud Management Software is designed to help you do just that. PEP Cloud was designed by and for painting professionals, and it handles all the technical and mathematical aspects of correctly estimating painting jobs. The program is convenient, affordable, and easy-to-use with the training PEP Cloud provides to all clients. In order to fully eliminate the possibility of inconsistencies in estimating painting jobs, you should be aware of all considerations that affect an estimate’s accuracy. 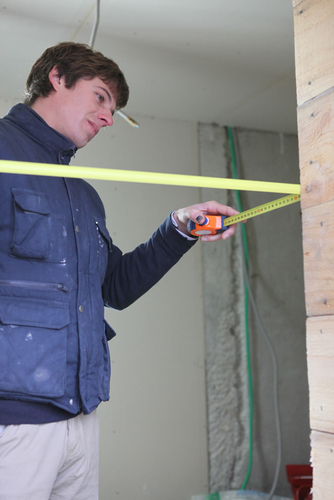 Making an accurate estimate isn’t as simple as measuring the square feet and calculating how much paint you’ll need. Each and every painting job comes with its own unique requirements, and many jobs require extra effort on your part to perfect the estimating process. Priming and painting are just two of the painting process steps; your estimate must reflect every step your painters will need to take in order to finish the job including covering stains, filling holes, making minor repairs, and anything else the client would expect you to include. To arrive at a fair price and determine how many hours and materials you’ll need to complete each painting job, you must consider the following questions. What is the Type of Job You are Quoting? Each type of painting job has its own degree of difficulty, and requires its own particular materials and tools. Will you be painting an interior or an exterior surface? Is the building commercial or residential? Is the painting job partial, or will you be painting a whole room or building? Is there water damage to the walls, windows or ceilings? Will you need to remove wallpaper? Will you need to remove lead paint? Are the surfaces already painted or primed? Are there any holes, cracks or chips that need to be repaired? How many windows need to be done? Are there inserts or design considerations for the windows? How many doors and what types of doors, e.g. solid or glass? How much trim is involved? What about the ceilings – is there texture or flat finish? What about cabinetry such as built in bookshelves or wood paneling? How easy will it be for painters to navigate the work site? If it’s an interior job, take note if the walls and ceilings are especially high. For exterior surfaces, assess the elevation to see whether you’ll need staging or scaffolding. Climate conditions depend on when and where you do each job. If it’s too cold or too hot, or if the surface will be too moist, you must take special precautions to maintain the proper consistency and drying time of the paint. Anticipate the temperature and humidity levels before scheduling the job in order to set the right expectations for your clients. For exterior jobs, extreme conditions are unpredictable, but you can still consider the overall climate and local patterns depending on where you live. Is the job urgent, or can your client accommodate a more flexible timeline? If you and your painters need to work toward a tight deadline, the price may need to increase in order to pay overtime or bring in more workers. Are you and your painter(s) readily available, or working on higher-priority jobs first? Will overtime pay be necessary? This affects scheduling and pricing. PEP, LLC presents PEP Cloud and PEP Cloud PRO as the leading edge estimating and business management cloud-based software program designed by a painter, for painting contractors. PEP Cloud is a strategic business tool that guides you in constructing a professional, legally binding proposal and contract for your clients which is quickly and easily delivered electronically for the convenience of all parties. PEP Cloud PRO, is designed to aid you in keeping your business organized, allowing you to easily track your jobs and clients, manage your employees, and correctly calculate your fees and expenses of all jobs, so you can achieve consistently the profitability you require. PEP Cloud and PEP Cloud PRO will help take your business to the next level and demonstrate the professionalism you desire for your company. Call us to schedule a demonstration of PEP Cloud and PEP Cloud PRO painting management software or sign up here to show you how estimating painting jobs is done with PEP Cloud and PEP Cloud PRO; and why it is critically important to do it right for the profitability of your painting business.